The great Sam Cooke got his start as a gospel singer with this group. Do not take me away, O my God, in the midst of my days; your years go on through all generations. The women said to Naomi: "Praise be to the Lord, who this day has not left you without a kinsman-redeemer. May he become famous throughout Israel! He will renew your life and sustain you in your old age. For your daughter-in-law, who loves you and who is better to you than seven sons, has given him birth." We learn that Ruth's faithfulness will pay a dividend far greater than comfort and possessions during her lifetime. She gives birth to Jesse -- who is fittingly born in Bethlehem and who will be the father of King David, and thus the direct ancestor of Jesus Christ. Jesse's primary role in the Bible is as the founder of the line of David and Jesus. Isaiah 11, the great prophecy that foretold the coming of Christ, begins with the line: "And there shall come forth a rod out of the stem of Jesse, and a Branch shall grow out of his roots". The imagery of Isaish 11, with Jesse as the root of a branch that would end with Christ, was adopted by painters and became the formal subject of dozens of paintings. These paintings are usually titled "the Jesse Tree" and depict Christ's lineage beginning with Jesse, a sort of family tree with Jesse at the bottom — "the roots" — and Christ on the top branch. One example of a Jesse Tree painting is shown below. 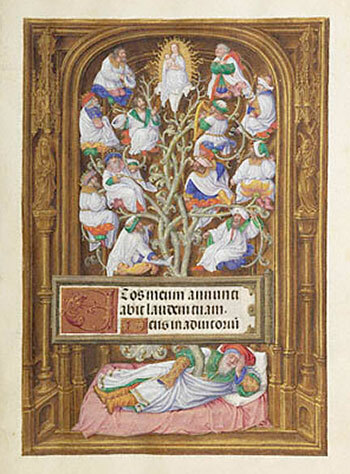 Tree of Jesse by a great Flemish illustrator, known only as the "Master of James IV of Scotland", circa 1500. Jesse can be seen lying at the bottom; at the top is the infant Jesus held by Mary.